Riverview Hobbies, LLC opened for business in 2010 to produce high quality aftermarket poured-resin products for scale modeling kits, an industry worth upwards of 1.5 billion dollars in the US alone, according to the Hobby Manufacturers Association (HMA). 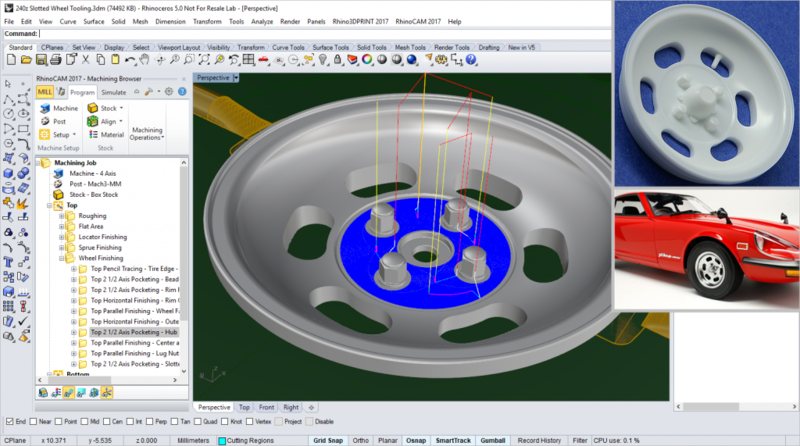 Jim Orth, owner/operator of Riverview Hobbies uses Rhino and RhinoCAM to design and program the CNC toolpaths required to machine single and multi-cavity molds for their aftermarket wheel kits. Shown below are toolpaths for the Riverview Hobbies RVH121001 Slotted Mag Wheel Kit designed for the 1/12 Tamiya Datsun 240ZG. We’ll be publishing more details of this project and more from Riverview Hobbies in upcoming weeks so stay with us! 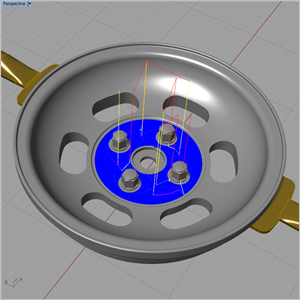 (Main Image) Shown modeled in Rhino, a prototype mold cavity for the Riverview Hobbies RVH121001 Slotted Mag Wheel Kit for the 1/12 Tamiya Datsun 240ZG model kit. On the left we see the RhinoCAM MILL Machining Browser listing toolpaths for the indexed 4 Axis machining job. (Top Right) A production component is shown. (Bottom Right) The 1/12 Tamiya Datsun 240ZG model kit is shown complete with the Riverview Hobbies RVH121001 Slotted Mag Wheel Kit. For more information about Riverview Hobbies we invite to visit them on the web at www.riverviewhobbies.com.